The Thomas Jefferson Building, built from 1890 to 1897, of the Library of Congress in Washington, D.C. is modelled after the Palais Garnier, most notably the facade and Great Hall. The Hanoi Opera House in Vietnam was built 1901–1911 during French Indochina colonial period based upon Palais Garnier. It is considered a representative French colonial architectural monument in Indochina. 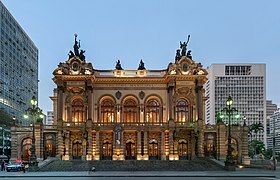 The Theatro Municipal do Rio de Janeiro (1905–1909) was also modelled after Palais Garnier, particularly the Great Hall and stairs. The Opéra Bastille is a modern opera house in Paris, France. Inaugurated in 1989 as part of President François Mitterrand’s “Grands Travaux”, it became the main facility of the Paris National Opera, France's principal opera company, alongside the older Palais Garnier; most opera performances are shown at the Bastille along with some ballet performances and symphony concerts, while Palais Garnier presents a mix of opera and ballet performances. Jean-Louis Charles Garnier was a French architect, perhaps best known as the architect of the Palais Garnier and the Opéra de Monte-Carlo. The Avenue de l'Opéra was created from 1864 to 1879 as part of Haussmann's renovation of Paris. It is situated in the center of the city, running northwest from the Louvre to the Palais Garnier, the primary opera house of Paris. 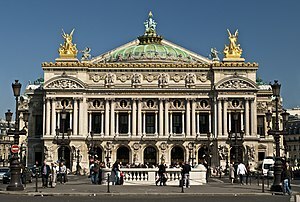 The Paris Opera is the primary opera and ballet company of France. It was founded in 1669 by Louis XIV as the Académie d'Opéra, and shortly thereafter was placed under the leadership of Jean-Baptiste Lully and officially renamed the Académie Royale de Musique, but continued to be known more simply as the Opéra. Classical ballet as it is known today arose within the Paris Opera as the Paris Opera Ballet and has remained an integral and important part of the company. Currently called the Opéra National de Paris, it mainly produces operas at its modern 2700-seat theatre Opéra Bastille which opened in 1989, and ballets and some classical operas at the older 1970-seat Palais Garnier which opened in 1875. Small scale and contemporary works are also staged in the 500-seat Amphitheatre under the Opéra Bastille. The Salle Le Peletier or Lepeletier was the home of the Paris Opera from 1821 until the building was destroyed by fire in 1873. The theatre was designed and constructed by the architect François Debret on the site of the garden of the Hôtel de Choiseul on the rue Lepeletier. Due to the many changes in government and management during the theatre's existence, it had a number of different official names, the most important of which were: Théâtre de l'Académie Royale de Musique (1821–1848), Opéra-Théâtre de la Nation (1848–1850), Théâtre de l'Académie Nationale de Musique (1850–1852), Théâtre de l'Académie Impériale de Musique (1852–1854), Théâtre Impérial de l'Opéra (1854–1870), and Théâtre National de l'Opéra (1870–1873). The Monte Carlo Casino, officially named Casino de Monte-Carlo, is a gambling and entertainment complex located in Monaco. It includes a casino, the Grand Théâtre de Monte Carlo, and the office of Les Ballets de Monte Carlo. The Toulon Opera, inaugurated on 1 October 1862, is the second-largest opera house in France, after the Palais Garnier in Paris, although it opened thirteen years before the Garnier. The inaugural performance was Les Mouquetaires de la reine, a comic opera by Fromental Halévy, followed a few days later by La Juive, the same composer's most famous opera. Today, the opera house is one of the country's national historic monuments. The Salle Favart, officially the Théâtre de l'Opéra-Comique, is a Parisian opera house and theatre, the current home of the Opéra-Comique. It was built from 1893 to 1898 in a neo-Baroque style to the designs of the French architect Louis Bernier and is located on the Place Boïeldieu just south of the Boulevard des Italiens. François Debret was a 19th-century French architect and Freemason. He was one of a group of influential academic architects in the 1820s and 1830s that furthered the precepts of Percier and Fontaine, although little of his own work survives. Théodore Lajarte was a French musicologist, librarian, and composer. Stanislas-Louis Bernier was a French architect. The Salle du Bel-Air or Salle du Jeu de Paume de Béquet was a 1672 theatre located in Paris, France. Originally an indoor tennis court it was converted by the Italian designer Carlo Vigarani into a theatre which was used by Jean-Baptiste Lully's Paris Opera from 15 November 1672 to 1 February 1673. It was located in the Rue de Vaugirard, just west of the city moat (fossé) and the Rue des Fossés Monsieur-le-Prince. Today the site of the former theatre extends into the Rue de Médicis, just south of no. 15 Rue de Vaugirard.